Wales wing David Brooks says he is determined to play a key role in helping Wales to reach successive European Championships. The Dragons qualified for Euro 2016 and reached the semi-final in their first major tournament appearance since the 1958 World Cup Finals. Brooks, named Wales' player of the year this week, is expected to play a key role under boss Ryan Giggs. "It is a really exciting time for me and the team," Brooks explained. Brooks is almost certain to start for Wales as they begin their campaign with a home qualifier against Slovakia. Brooks has enjoyed a meteoric rise in the past 12 months, capped off by being the first player in history to win the Wales player and young player of the year awards in the same year. The 21-year-old is also a contender for this season's PFA young player award following his move from Sheffield United to Bournemouth last summer. Brooks has scored six goals in 25 Premier League appearances and had been linked with moves to Manchester United and Tottenham Hotspur before signing a new contract with the Cherries. Brooks says he is determined to play a key role as Wales bid to match their Euro 2016 campaign under manager Ryan Giggs, especially playing alongside key personnel like Real Madrid's Gareth Bale and Juventus-bound Aaron Ramsey. "I think obviously when I came in during the last campaign it was towards the end, so to start the campaign this time is really exciting for myself and the team," he explained. "I play with the likes of Gareth Bale and Aaron Ramsey, you feel like you've got the same ability as them and can impose yourself on the game. "They are world class players, they've played at the top level so you do look up to them and take notes off them in training and in games, and when the advice comes you have to listen and absorb it into your own game. "You will always get… not star-struck; but you always want to play with those kinds of players and thankfully I get the opportunity to do so. "I think all our fixtures are tough, the group has quality throughout so we will have to be at our best in every game. "But we will go into Sunday and every game with the belief we can win." Brooks admits his superb season, where he has shone for his club, has surprised even him. 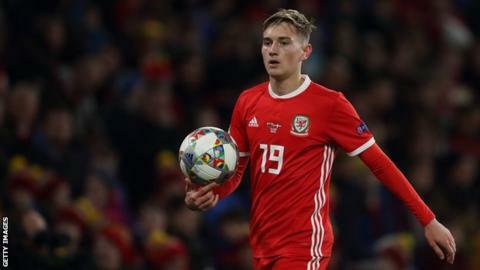 "Yes, it has been a bit of a whirlwind of a season making the transition to playing in the Premier League and also playing for Wales as well," he added. "It has been a really good year and one that people probably wouldn't have anticipated. Hopefully it can get even better. "If you ask any young boy what they wanted to do in their football career, they will tell you they want the Premier League and to play at the highest level possible and thankfully I am doing that at the minute and hopefully I can keep progressing."